On Tuesday, the German Wind Energy Association (BWE) published stats on new turbines in 2016. Both onshore and off, wind growth continues to be healthy. And PV was also added roughly in line to keep feed-in tariffs from rising. Craig Morris takes a look. Germany currently has a target of 2.5 GW of new onshore wind capacity annually, along with 6.5 GW in total (not annually) offshore by 2020. Last year, Germany added 818 MW (0.818 GW) at sea, bringing the total up to 4.1 GW. According to the German Offshore Wind Foundation, another 1.4 GW could be completed in 2017 alone, bringing Germany very close to its target for 2020 three years in advance. Onshore, Germany now has 45.9 GW of wind power after 4.625 GW was newly added, with 366 MW having been decommissioned, leaving net additions at 4.259 GW, according to statistics published on Tuesday (in German). The official target corridor is, however, much less at 2.4 – 2.6 GW. Experts point out that 2016 was the last year in which new projects could be built without participating in an auction. The main effect of auctions is to prevent growth from surpassing the volume on offer. Project planners therefore rushed to finish wind farms before the government could reject projects outright. In 2017, the last of these wind farms – those that had already received permits – will be completed, but overall the market will slow down as the government requires all wind turbines larger than 750 kW to be auctioned; the average new unit in Germany is roughly four times larger at 2.8 MW (PDF in German). A similar run on the market occurred with PV. “Of the 441 MW completed in December, 316 MW was solar arrays of a size that fell under auctions starting this year,” according to the German Network Agency. The boom in December was the largest of any single month going back to 2012, when Germany switched from annual to monthly scheduled FIT reductions to prevent runs. The roughly 51,900 arrays added last year accounted for 1.52 GW in total, bringing the country up to 41.2 GW at the end of 2016. Germany thus just barely reached its lower target of 1.5 GW for the year to keep feed-in tariffs from rising, but fell far short of the actual goal of 2.5 GW. Feed-in tariffs, which are still available for arrays smaller than 750 kW, will therefore remain unchanged. The smallest arrays now newly installed (below 10 kW) get 12.3 cents per kilowatt-hour, while the largest (bigger than 100 kW) get 10.69 cents. FITs for solar have not been reduced in years as Germany repeatedly fails to build enough, and they can rise if not enough is built. Against that backdrop, let’s look at how the country is progressing towards its target of 40-45% renewable power by 2020. Clearly, the government is working to slow down wind and solar so that Germany does not overshoot its 45% maximum target for 2025. In fact, renewable power will only be able to grow roughly half as fast over the next eight years as it did in the past seven; the annual growth rate will have to fall from 2.6% to 1.4%. 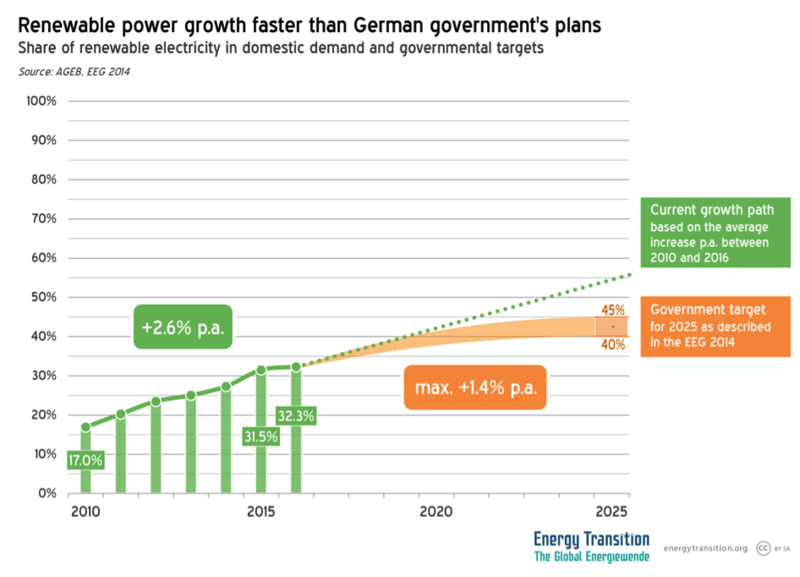 If the old growth rate continued, Germany would instead have closer to 55% renewable power in 2025. For what it’s worth, we don’t have final figures for bioenergy in 2016, but the German Statistics Office has published a preliminary estimate of 148 MW (electric) of new biogas units. If so, that growth would be much higher than the official target of 100 MW annually. At the same time, the replacement rate alone (assuming a 20-year service life) would be closer to 200 MW annually, so the biogas market is shrinking in the long view. As previously mentioned, the German government has essentially ended the expansion of bioenergy. The first auctions will soon be held for onshore wind, and the PV arrays from the first round of auctions held in April 2015 have until the end of March to be finished. At the end of 2016, some 6.1 GW of onshore wind still eligible for FITs was in the pipeline, so the sector expects another 4.5 – 5-0 GW to be added this year. Offshore wind is also expected to grow strongly, and large PV arrays are facing deadlines in 2017, so installed capacity could continue to grow quite strongly. If it does, the future cutbacks will only be steeper as long as Berlin sticks to its maximum target. What are the prospects for wind in Germany outside the auction framework? There is a lot of talk in Scotland about this, against an even more hostile policy climate. I assume that EU competition law prevents the German (and still the UK) government from actually stopping such projects. I also assume that offshore wind still needs an above-wholesale auction price to be viable. But with turbine prices allowing <3.5c/kwh wind pretax in the US Plains, onshore parity with wholesale can't be far off in Germany. Selling directly into the spot wholesale market would be risky, so the developers would look for 25-year PPA offtake contracts with large consumers or distributors. There are prices for both wind and solar at which governments lose control of the installation rate. The days are not far off. James, I should reword my statements: the government will not tell anyone they can’t build (at least not with auctions, but by withholding permits). Rather, without a winning bid, it won’t pay to build; you’d have to find a buyer. Any German wind farm that can go below 5 cents will win the auction. Any project that can’t go that low won’t find a buyer. Who controls permitting in Germany: the federal government, Länder, or local government? Inmost places, it’s a land-use issue, and decisions are pretty local. The British government handed (or so it claimed) planning decisions on wind back to local authorities which means that English counties are free to block and Scottish ones to give the go-ahead. Bavaria passed a law imposing impossible minimum distance requirements from turbines to buildings, a ploy also used in Poland and Ohio. This suggests that Schleswig-Holstein has a free hand under current German law. The same is done in Germany, many industrial and commercial self-consumption projects are up and running already avoiding the grid,the FIT. An interesting item – congrats on digging it out! On site can’t work for steel. One tonne of steel needs 0.45 MWh of electricity (source link), so a 1m tonne/yr steel mill using scrap would need 450 GWh, which on 24/7 use requires a steady draw of 51 MW. This is however entirely doable with a PPA from a wind developer, dedicating say 100 MW of nameplate capacity to the contract and selling any surplus on the spot market. The supplier would have to find a solution for backup, probably a gas generator. All REs are showing at least a good growth. Next PostNetherlands: A silver lining for renewables?